Take the following components : open plan living, your favorite pets and the occasional need for room dividers. Add them all into an equation and you come up with Librato. What is Librato? 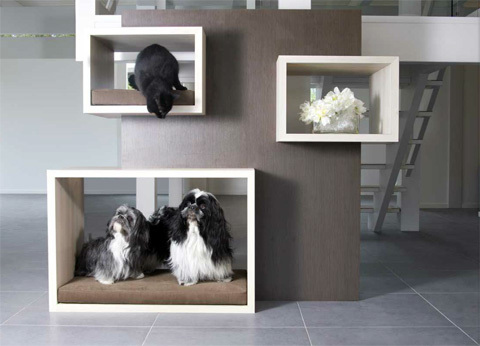 It is a room divider designed to serve the needs of your beloved four legged friends, while they elegantly get absorbed in the design of your modern home, assisting into defining these different function areas. 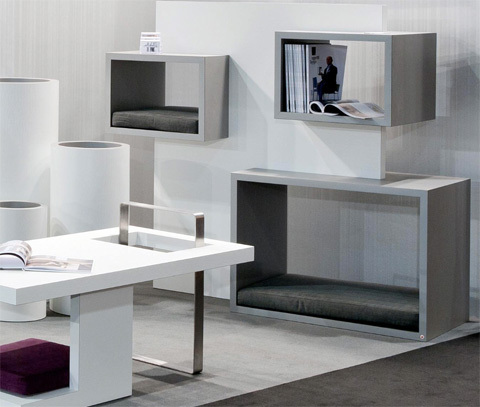 If you thought plants, curtains or double sided bookcases are the only ways you can achieve that, it’s time to reevaluate by considering Librato. Let’s take a closer look at it. It measures 133 cm in height, 149 in length and it is 50 cm deep. It comes with three embedded cubes. In fact the large one, placed close to the floor, is a fairly generous in size rectangle 80 x 50 cm, where even a large dog or your two smaller ones can rest, take a nap or simply watch you while you move into the space. For their comfort a pillow comes together. Part of the pets mood series, delivered to us by Misk Design, Librato is featuring also two floating cubes, measuring 45 x 50 cm each, which can be used either to display your favorite objects and books or to offer some entertainment to your kitty, which will for sure be thrilled with the possibilities. In that case, extra pillows are available. Librato is offered in a three combinations of laminates and respective pillow colors, ranging from stone beige, to chestnut brown and shades of greys.